Today we speak with Patricia McClintock of Patricia McClintock & Associés, as part of our series focusing on the hospitality designers, architects and purchasing pros participating in Hi Connect Design 2014. We’re getting ready for our BIG event Hi Connect Design coming this April 2-4, 2014 at the Gaylord Opryland in Nashville, TN. Now and register to be a part of this amazing event. We’ve got dozens of built out fully constructed out vignettes created by the vision of leading hospitality designers, architects and purchasing pros. And those in attendance will get to step into their master creations, get a tour and see products in the content in which they belong; in a real hotel environment! HI Connect Design offers attendees an incredible opportunity to view, first hand, original concepts designed by industry designers and purchasing companies in collaboration with suppliers shown in context within a real environment of a guest room, bathroom, and public spaces such as Bar/Lounge, Spa/Fitness to name a few. This is a truly the most collaborative effort ever at any hospitality event. As part of our countdown to HI Connect 2014 we’re interviewing the people that are bringing their creative vision to life. Read the story below, or for a more fully in-depth interview listen to their story below. 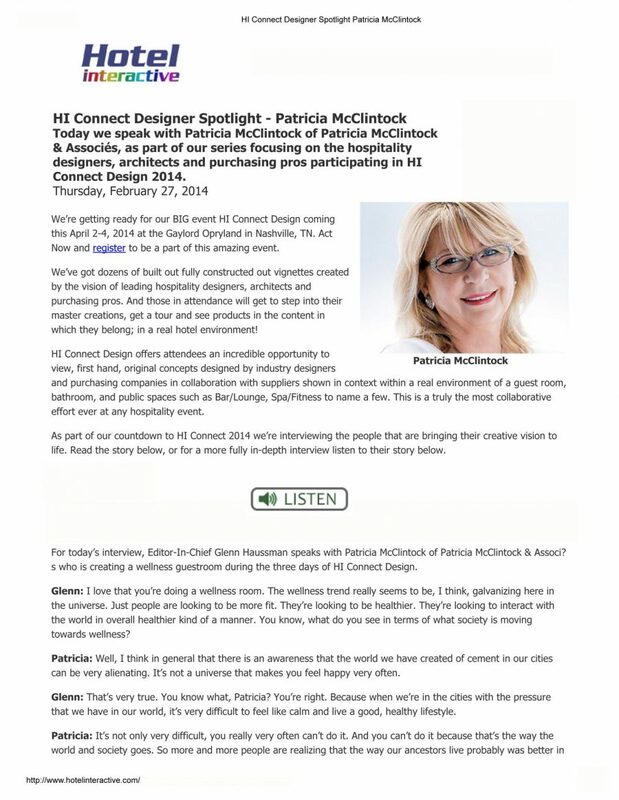 For today’s interview, Editor-In-Chief Glenn Haussman speaks with Patricia McClintock of Patricia McClintock & Associés who is creating a wellness guestroom during the three days of HI Connect Design. Glenn: I love that you’re doing a wellness room. The wellness trend really seems to be, I think, galvanizing here in the universe. Just people are looking to be more fit. They’re looking to be healthier. They’re looking to interact with the world in overall healthier kind of a manner. You know, what do you see in terms of what society is moving towards wellness? Patricia: Well, I think in general that there is awareness that the world we have created of cement in our cities can be very alienating. It’s not a universe that makes you feel happy very often. Glenn: That’s very true. You know what, Patricia? You’re right. Because when we’re in the cities with the pressure that we have in our world, it’s very difficult to feel like calm and live a good, healthy lifestyle. Patricia: It’s not only very difficult, you really very often can’t do it. And you can’t do it because that’s the way the world and society goes. So more and more people are realizing that the way our ancestors live probably was better in some ways. They lived closer to nature. They didn’t need as much as we have to be happy. And certainly, their way of living was less costly. But now we can’t completely go back in time and in history. We still have to continue to look forward and live in the world we are, but I think human beings are accepting that you have to take care of yourself and you have to get closer to nature. So you want to be in a state of wellness. What is wellness? It’s really the quality of being healthy both in mind and body. It’s being in a state where you’re calmer, where you react, you know you’re closer to nature. Originally in India, you had what they called the Ayurvedic Principles and those principles where you take care of your mind and you take care of your body because the mind affects the body. And if you read, there are a number of philosophers who in a very Cartesian world for example, like the one in France, they would all say the same thing. The mind has an impact on the body. But the mind is a very fragile tool so you have to put it back in a space or in a place where you can rest and relax and be less stressed. And so this entire concept is what they call now wellness. And people seem to find that there’s a need to get close to nature. There’s a need to take care of yourself. There’s a need to be fitter. There’s a need to eat normally. Our grandmothers had a much more logical diets than we do. Glenn: Oh, that is so true. I feel like starting in a post-World War II era, we all just kind of went really, really fast ahead into this future type of world. And a lot of that included a faster paced lifestyle. Getting into our cars and commuting long distances to work every single day and eating non-natural foods anymore, foods that have been so processed. And we were told and I think pretty much as a society we all bought into it, that that was the way it should be. But now, 60 years later, we’re learning maybe not so much. Maybe your grandmother did have it right. this world, but at the same time, we need to, each one of us, individually take care of ourselves and there are many, many ways of getting into this state of wellness. Glenn: How do we get into that state then? Patricia: Well, first of all, every once in a while we’re stepping back and thinking and saying, you know, I need to take a break from the rat race because it’s not working in the sense that you become physically not well, then you need to go and see a doctor. It’s becoming more and more complex, at least in Canada where we are living. It’s also more and more costly so when it’s too costly, that also affects your wellness because can’t always afford it. It’s a vicious circle to be quite honest. So people are saying now or are more open to the fact that there are different ways of going about it. Why don’t you prevent illness? Treat the body, treat the mind so you can prevent illness and not have to be dealing with illness. 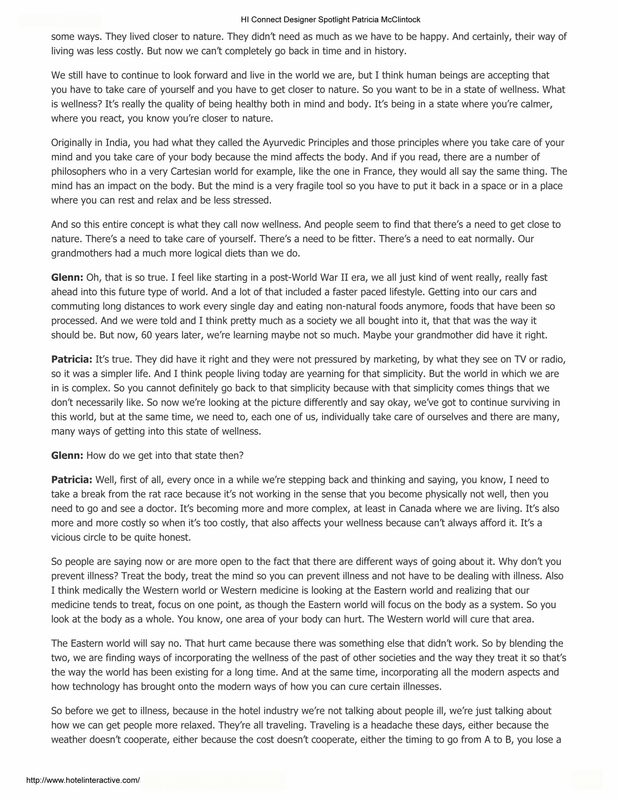 Also I think medically the Western world or Western medicine is looking at the Eastern world and realizing that our medicine tends to treat, focus on one point, as though the Eastern world will focus on the body as a system. 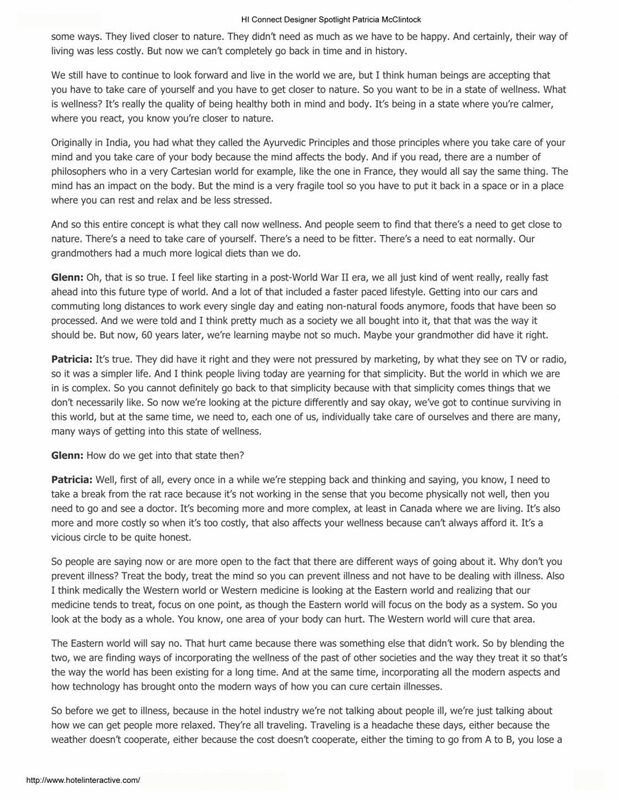 So you look at the body as a whole. You know, one area of your body can hurt. The Western world will cure that area. The Eastern world will say no. That hurt came because there was something else that didn’t work. So by blending the two, we are finding ways of incorporating the wellness of the past of other societies and the way they treat it so that’s the way the world has been existing for a long time. And at the same time, incorporating all the modern aspects and how technology has brought onto the modern ways of how you can cure certain illnesses. So before we get to illness, because in the hotel industry we’re not talking about people ill, we’re just talking about how we can get people more relaxed. They’re all traveling. Traveling is a headache these days, either because the weather doesn’t cooperate, either because the cost doesn’t cooperate, either the timing to go from A to B, you lose a lot of time and we already don’t have enough time because we’re very taxed, so we want rooms that are more appealing, more comfortable. And now we’re even getting to the point we’re saying well, why don’t we bring in a little bit of this wellness into our rooms. I’m not saying it’s for every hotel, nor is it for all the rooms of a hotel. But there are a number of clients or guests who are into this wellness trip. And they would like to find that in the hotel room that they, in the hotel that they go to. Glenn: I agree. I think that’s a really terrific notion that we really need to think about. It’s time for us to step back and really think about what’s important to us in our lives. And for many people, it is trying to take a respite and have more of a reflective moment, and be able to re-energize and put yourself together in order to face the ordinary stresses that we have every day. And I think that the hotel room has always symbolized that place where we could find peace. But now, you and other folks are really starting to think about what does that really mean and how can we incorporate new elements into a hotel room that really is proactive in the sense of creating a state of wellness for the person’s mind and soul, yes? 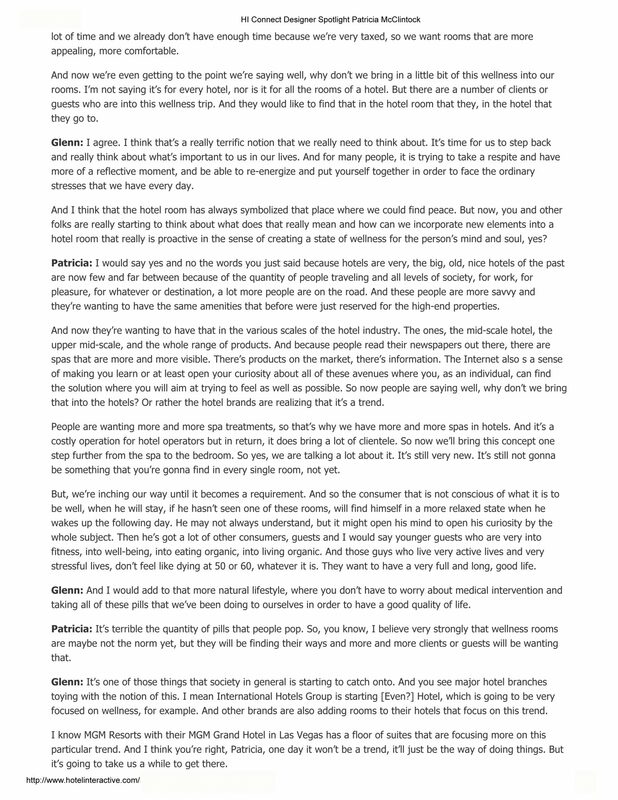 Patricia: I would say yes and no the words you just said because hotels are very, the big, old, nice hotels of the past are now few and far between because of the quantity of people traveling and all levels of society, for work, for pleasure, for whatever or destination, a lot more people are on the road. And these people are more savvy and they’re wanting to have the same amenities that before were just reserved for the high-end properties. And now they’re wanting to have that in the various scales of the hotel industry. The ones, the mid-scale hotel, the upper mid-scale, and the whole range of products. And because people read their newspapers out there, there are spas that are more and more visible. There are products on the market, there’s information. The Internet also s a sense of making you learn or at least open your curiosity about all of these avenues where you, as an individual, can find the solution where you will aim at trying to feel as well as possible. So now people are saying well, why don’t we bring that into the hotels? Or rather the hotel brands are realizing that it’s a trend. People are wanting more and more spa treatments, so that’s why we have more and more spas in hotels. And it’s a costly operation for hotel operators but in return, it does bring a lot of clientele. So now we’ll bring this concept one step further from the spa to the bedroom. So yes, we are talking a lot about it. It’s still very new. It’s still not gonna be something that you’re gonna find in every single room, not yet. But, we’re inching our way until it becomes a requirement. And so the consumer that is not conscious of what it is to be well, when he will stay, if he hasn’t seen one of these rooms, will find himself in a more relaxed state when he wakes up the following day. He may not always understand, but it might open his mind to open his curiosity by the whole subject. Then he’s got a lot of other consumers, guests and I would say younger guests who are very into fitness, into well-being, into eating organic, into living organic. And those guys who live very active lives and very stressful lives, don’t feel like dying at 50 or 60, whatever it is. They want to have a very full and long, good life. Glenn: And I would add to that more natural lifestyle, where you don’t have to worry about medical intervention and taking all of these pills that we’ve been doing to ourselves in order to have a good quality of life. Patricia: It’s terrible the quantity of pills that people pop. So, you know, I believe very strongly that wellness rooms are maybe not the norm yet, but they will be finding their ways and more and more clients or guests will be wanting that. Glenn: It’s one of those things that society in general is starting to catch onto. And you see major hotel branches toying with the notion of this. I mean International Hotels Group is starting [Even?] Hotel, which is going to be very focused on wellness, for example. And other brands are also adding rooms to their hotels that focus on this trend. I know MGM Resorts with their MGM Grand Hotel in Las Vegas has a floor of suites that are focusing more on this particular trend. And I think you’re right, Patricia, one day it won’t be a trend, it’ll just be the way of doing things. But it’s going to take us a while to get there. So that’s what you’re gonna be doing. 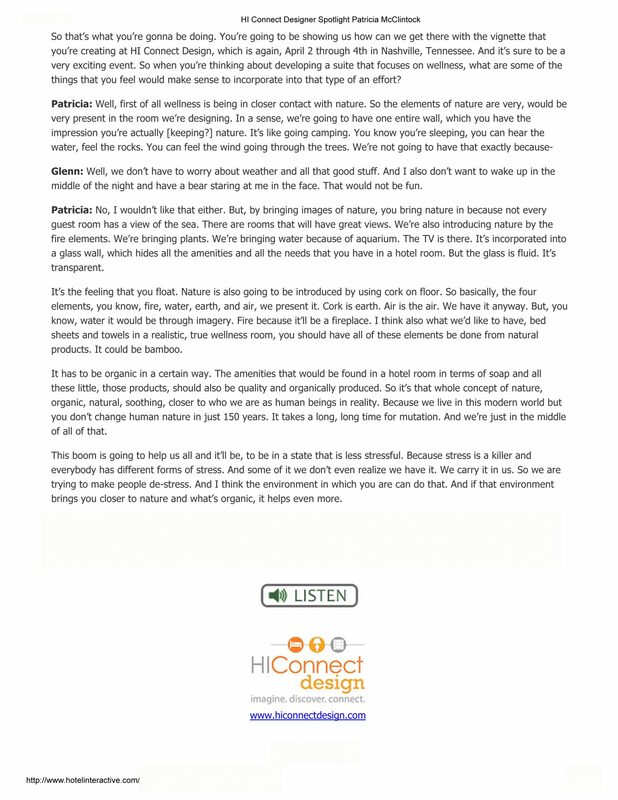 You’re going to be showing us how can we get there with the vignette that you’re creating at HI Connect Design, which is again, April 2 through 4th in Nashville, Tennessee. And it’s sure to be a very exciting event. So when you’re thinking about developing a suite that focuses on wellness, what are some of the things that you feel would make sense to incorporate into that type of an effort? Glenn: Well, we don’t have to worry about weather and all that good stuff. And I also don’t want to wake up in the middle of the night and have a bear staring at me in the face. That would not be fun. Patricia: No, I wouldn’t like that either. But, by bringing images of nature, you bring nature in because not every guest room has a view of the sea. There are rooms that will have great views. We’re also introducing nature by the fire elements. We’re bringing plants. We’re bringing water because of aquarium. The TV is there. It’s incorporated into a glass wall, which hides all the amenities and all the needs that you have in a hotel room. But the glass is fluid. It’s transparent. It’s the feeling that you float. Nature is also going to be introduced by using cork on floor. So basically, the four elements, you know, fire, water, earth, and air, we present it. Cork is earth. Air is the air. We have it anyway. But, you know, water it would be through imagery. Fire because it’ll be a fireplace. I think also what we’d like to have, bed sheets and towels in a realistic, true wellness room, you should have all of these elements be done from natural products. It could be bamboo. It has to be organic in a certain way. The amenities that would be found in a hotel room in terms of soap and all these little, those products, should also be quality and organically produced. So it’s that whole concept of nature, organic, natural, soothing, closer to who we are as human beings in reality. Because we live in this modern world but you don’t change human nature in just 150 years. It takes a long, long time for mutation. And we’re just in the middle of all of that. This boom is going to help us all and it’ll be, to be in a state that is less stressful. Because stress is a killer and everybody have different forms of stress. And some of it we don’t even realize we have it. We carry it in us. So we are trying to make people de-stress. And I think the environment in which you are can do that. And if that environment brings you closer to nature and what’s organic, it helps even more.